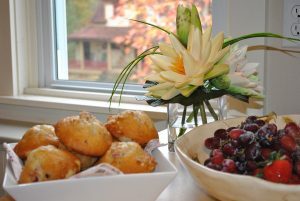 Visitors to New Brunswick have the opportunity to stay in a wide range of bed and breakfast properties. Urban, rural, seaside and inland – there are many great choices. Bed and breakfasts have always been popular accommodation options for visitors to the province, especially in coastal towns like St. Andrews, NB. Many of the bed and breakfast listings in New Brunswick are filled with the history of the region. There are stately homes once owned by the wealthy ship builders of the mid-1800s. Grand Victorian buildings line the quiet streets in towns once committed to fishing, lumber, canning and shipbuilding — but now dedicated to welcoming visitors to the Bay of Fundy region. Mansions and estates, often established during the “gilded age” reflect the lifestyle of the wealthy families that summered along the coast, many in the area near St. Andrews. 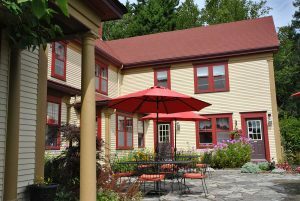 Today, bed and breakfasts in New Brunswick offer visitors the opportunity to explore the region’s history, offering charm, comfort and a romantic setting. Gone are the days when a bed and breakfast implied a sacrifice in privacy, amenities, or special services. 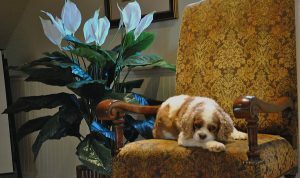 Many bed and breakfast properties rival the very best hotels for quality, personalized attention and modern conveniences. Dominion Hill Country Inn is an example of an estate that has been transformed into a unique bed and breakfast. In the 1920s a country farm was purchased by the Curtis family, owners of a publishing empire that was headquartered in Philadelphia. They constructed a Manor House, cottages for family members, a barn, blacksmith shop, garage for carriages, and created elaborate gardens. The home was decorated with beautiful furnishings and paintings by Norman Rockwell, the artist for their magazines, that including the The Saturday Evening Post. After extensive renovations in 2017, Dominion Hill retains much of that century-old elegance and charm. Located at the mouth of the Digdeguash river, Dominion Hill stood at the gateway to St. Andrews, NB, the community considered to be Canada’s #1 coastal town for vacationers. Staying at a bed and breakfast has many advantages not found in larger hotels. You can be assured of personal attention and a warm welcome. Your room will be well-appointed with privacy and modern conveniences. There will probably be a variety of amenities and things to do. (Dominion Hill has a restaurant, bar services, a wellness centre, hot tub, bicycles and more.) Very importantly, many bed and breakfast properties will offer all of these things at a very reasonable price. In summary, enjoy your visit to New Brunswick and the area around St. Andrews, and consider staying at one of our historical bed and breakfast properties. We are sure you will have a special experience and create some lasting memories. A directory of the things to do in the area is available for Charlotte County.